Nakipagdate Ang Lalaking Kulang Ang Kaalaman!!!!! 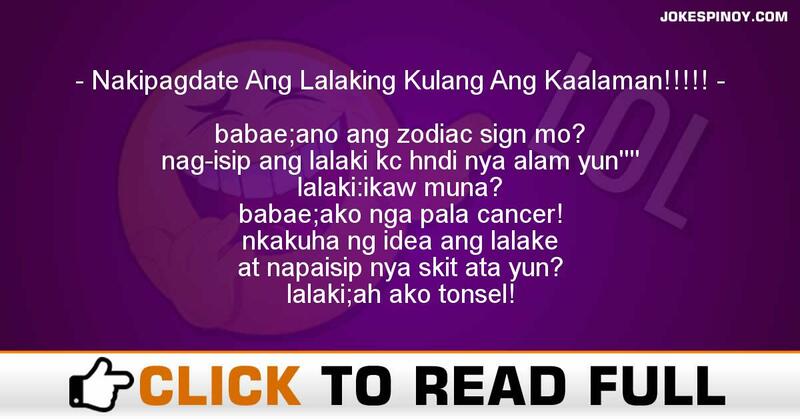 babae;ano ang zodiac sign mo? at napaisip nya skit ata yun? tumawa ng mlakas ang babae. at na phiya ang lalaki sbay sabi! This is so great i love the script thanks for the comedy he gave me an idea thanks. Hey people… Can anyone give me the English translation on this. I need it asap for a performance. Thank you. Girl: What is your Zodiac Sign? The boy doesn’t know what a Zodiac sign is. He though that it was a disease. The girl laughed and the boy felt shy. Boy: Just kidding… My Zodiac sign is GOITER!!! not good, totally not good. ? Now, that was ridiculously good. mas mabuti yatang pagisipan muna ang isasagot bago sumagot para hindi mapahiya. ABOUT US : Laughter is the best medicine as the old saying says, we at JokesPinoy.com will supply you with all the comical filipino quotes and photos in tagalog language. Back in 2013, a group of Filipino OFW (Overseas Filipino Worker) got bored and they attempt to look for some funny quotes on the web simply to have fun but sadly most of the websites they found on that time are having an aged jokes and have no interaction with the users. From that moment, they subsequently got an idea to build their very own jokes website and let other users to give their jokes or opinion with the present jokes. After the funds and ideas gathered, JokesPinoy.com was born, a website that let the user share their jokes and let them have dialog with other users too. Since the website has been launch, a large number of visitors are coming each day to read jokes and have fun on the website and also as giving their opinion on the jokes they read. We hope from JokesPinoy.com this website may provide you some smile and happiness, Life is Short so have fun on it. DISCLAIMER: A number of the jokes, photos and videos seen in this site aren't created by us, they can be created by our users or they just get it somewhere in the web only like 9gag, youtube, metacafe, vimio and etc. We respect copyright information which is posted here including funny pictures and humorous videos. If encase there are files posted here in our site that is owned by your and you don't need to share it to anybody then fell free to contact us to remove it. Most of the language used on this particular site was in tagalog and some are bisaya that are both filipino language which originated from Philippines, should you need to translate the joke to english you can used an online translator to interpret it from tagalog to english.